The first leg of the hike (approx. 45 minutes) is the most strenuous, as it has the steepest ascents as you climb to the highest point, the 284 metres of Shek O Peak. It's certainly worth it though, for the stunning panoramic views. I would have liked a slightly clearer day than I got, but it was still beautiful to see. The hike is in the southern district of the island, so you can see out to the South China Sea, as opposed to the waters of Victoria Harbour that I've become familiar with. Going in the direction I did, heading north from Shek O Road, you can see Tai Tam Bay to the left, with the buildings of Red Hill directly opposite, and Stanley peninsula reaching to the south. Lamma Island lies beyond these, but I couldn't see much due to the clouds. To the right, is the unique land form of Shek O village and beach, with Ng Fan Chau island next to it. The bigger, further off island if Tung Lung Chau, and north of Shek O, you can see the waves crashing on Big Wave Bay Beach, my final destination, and Kowloon in the distance. 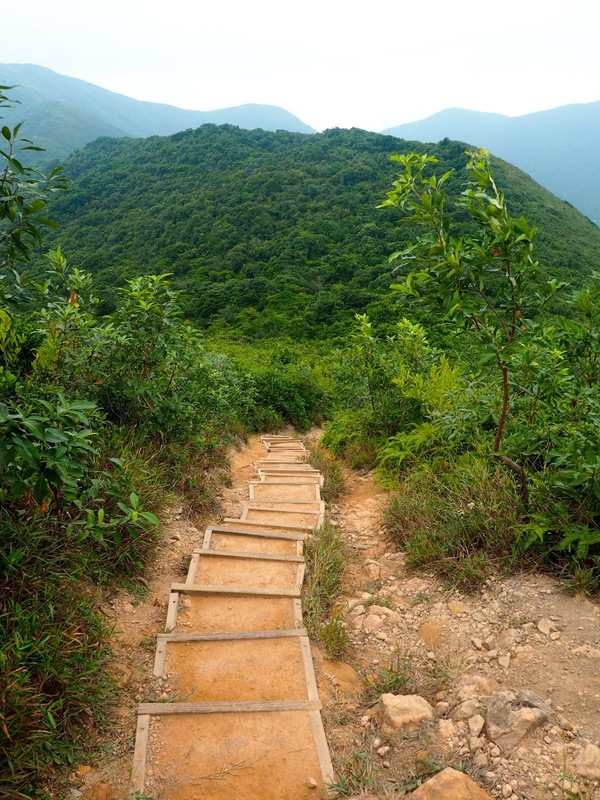 Directly ahead, and behind are the hills of Shek O Country Park and D'Aguilar Peninsula. I had to whittle down so many photos when I got home, as the views kept getting better as I approached the peak! 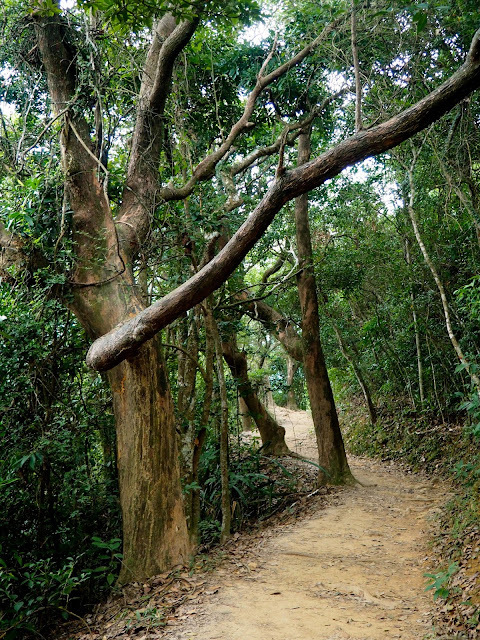 After Shek O Peak, there's still a little bit of up and down over the next few hills, before you descend into the forest. 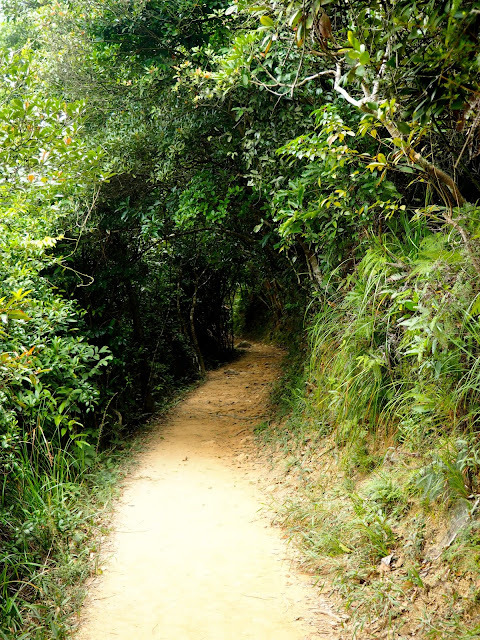 The remaining hour or so of the hike doesn't have views anything like those of the first leg, but is instead, a winding trail through the shady forest. Occasionally you catch glimpses of the ocean through the foliage, but the only really good view is the one below, of Chai Wan to the north. It's a pleasant walk though, and since I was there on a Monday, it was pretty quiet too, with only a handful of other hikers around. While I do like my weekends with my friends here, I also enjoy my alone time, so it was nice to have some peace and time to myself. 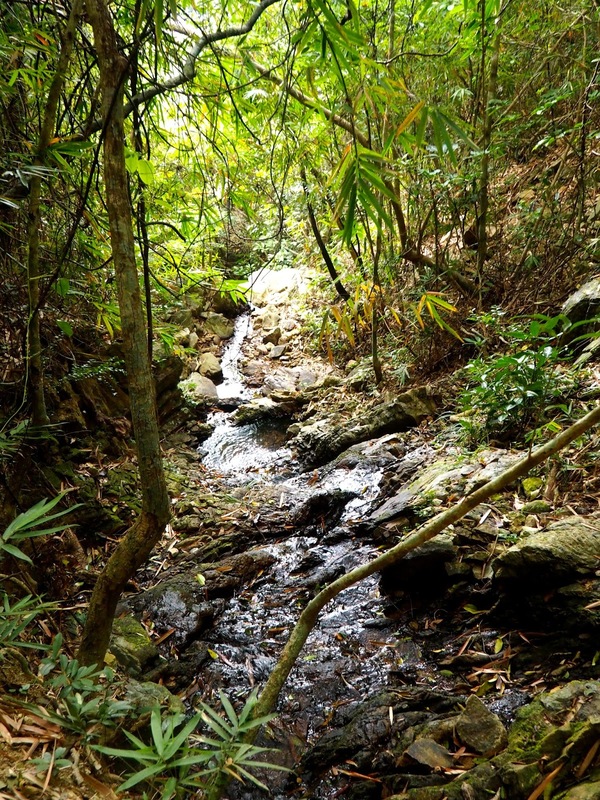 Aided of course, by the fact that I was out in nature, away from the chaos of city life in Hong Kong. It's still such a novelty to me that you can escape this densely crowded city and head into countryside, forest, and beach areas so easily! 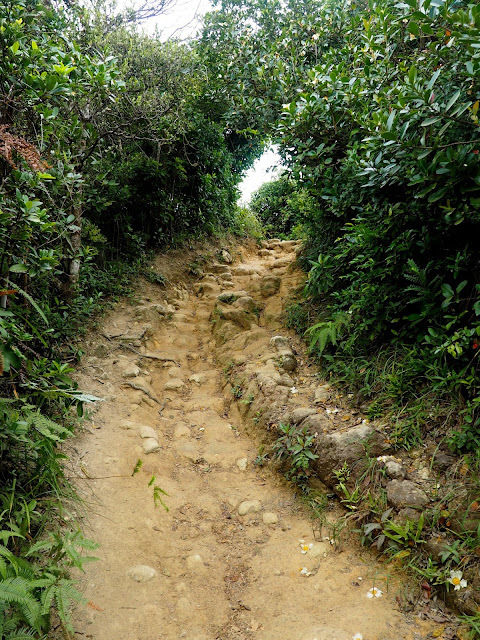 The forest path was pretty narrow, and there's a few steep drops to remind you that you're still on a hillside. There's also these tiny, rocky waterfalls, though several didn't have a whole lot of water those days! 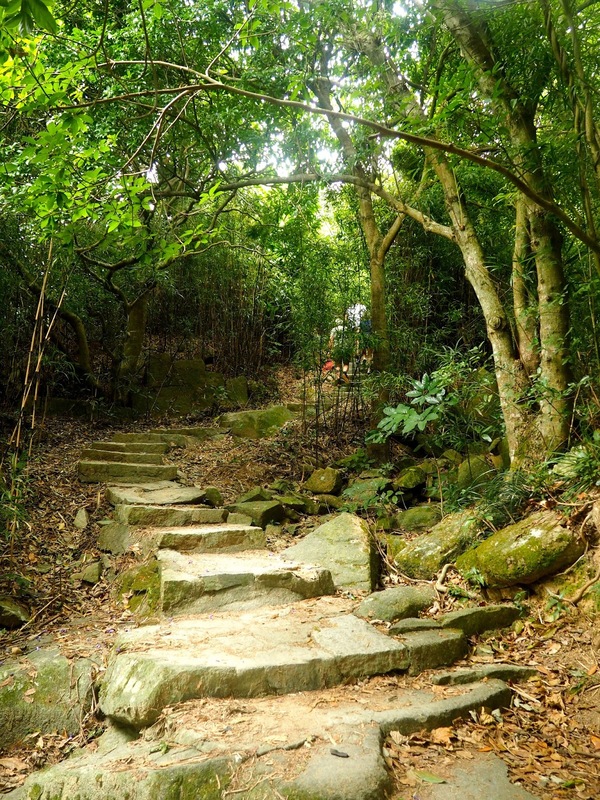 After the view of Chai Wan, and passing through a picnic area, you have to take a sharp right and head down some steps. The whole trail is well signed though - just keep making for Big Wave Bay! - but I assume some of these other options on the sign either take you back to roads and bus stops, or on a longer hike, based on what some of them read. Eventually, the trail descends all the way down into Big Wave Bay village, which is a far cry from the massive skyscrapers of the city! I almost felt like I was walking through people's yards, following the steps down a narrow street, bordered by small, simple, white houses. It felt like a world away from the city that I knew was so close by, and definitely had a seaside feel to it with all the white! Again, it's pretty easy to find the beach by following signs, particularly the big blue surfboard. Big Wave Bay is pretty small, being a sort of cove tucked away in the folds of the island's coastline, and is certainly aptly named! It's popular with surfers because of these waves coming in from the South China Sea, and there were a few around when I was there - though again, it wasn't too busy, since it was a Monday. I'd ended up meeting another girl, another English teacher about my age, towards the end of the trail, and we'd got chatting, so we spread our towels on the beach next to each other, and had some fun splashing around, and trying not to get completely washed away by those big waves! Eventually it got to be later than 5pm, and she'd already left, so I headed for home. This was a little confusing at first - you can take the no.9 bus back from the stop just up the road, but it was taking a long time, so I ended up jumping on red minibus going to the MTR. If you don't know, the red minibuses don't have a fixed schedule, route or fare - you jump on one with your destination (or somewhere near!) on the front, whenever it turns up, and shout to the driver when you want to get off, paying in cash when you do. 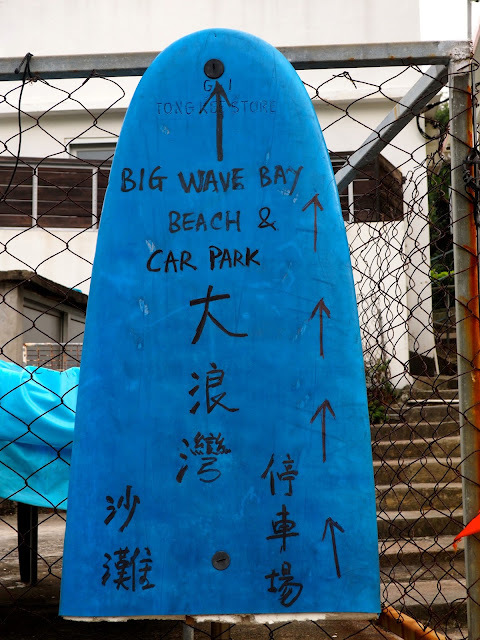 I was a little confused though when we drove to Shek O, and then straight back to Big Wave Bay! I stuck with it though, and it seemed to be to make sure the bus was full before heading all the way to the MTR, and sure enough our second departure took us to the station, from which it's easy to navigate back home.